sycamore stirrings: Mushrooms are FUNgi! My youngest received this darling backpack from our neighbors (Thanks Michele!) for her 2nd birthday. I couldn't have been more pleased as I'm going through a bit of a mushroom/fairy/gnome phase right now. My phase, however, is NOTHING compared to the obsession I found on this blog. So flippin' cute! I looked over every picture, clicked every link, and read each post. I'll definitely head back there on days when I need a little cute fix. And, YES I will be making the toadstool doorstop. 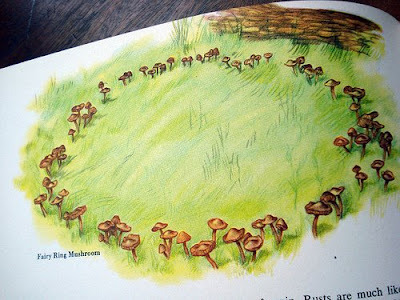 Long ago people thought that the rings formed by the fairy ring mushroom were actually made by fairies. Scientists know no that the mycelium of this plant spreads underground in all directions to form the circle. Another name for this small mushroom is "Scotch Bonnet." How cool is that? I won this vintage kettle cloth recently on ebay. Think it is destine to become a sewing machine cozy. I also purchased this photograph on etsy. Whew. What are you into these days? Do tell! That is such a cute backpack! I LOVE LOVE LOVE toadstool mushrooms. Funny that you mention them since last weekend I made a toadstool fairy (without a fairy) birthday cake for my oldest daughter. You can view my sad attempt here http://thelopsidedhouse.blogspot.com/2008/08/cake.html. By the way, we still love doing the muffin tin (ie. Party) lunches and do them most days. Thanks for the inspiration! loved your feature at today's creative blog! you have some fabulous ideas! i will have to start the muffin tin lunches too! 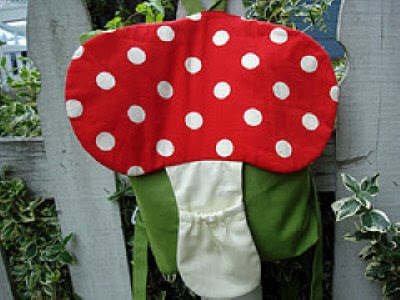 did you buy the toadstool apron? So cute! 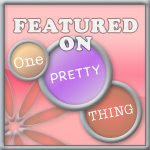 I just found your blog today... and I love the muffin tin idea. I don't have any littles but I have a 3yo niece that comes and stays with us often. 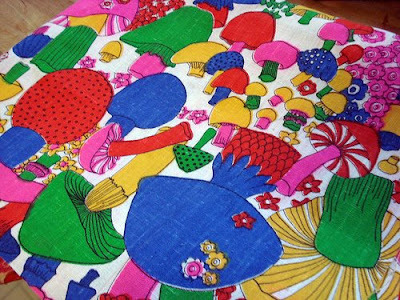 AND when I saw the mushroom kettlecloth... that totally brought back memories. My mom made me a sundress out of it! I tried looking for a picture I know we had of me in it but couldn't find it! Thanks for the memories and ideas!